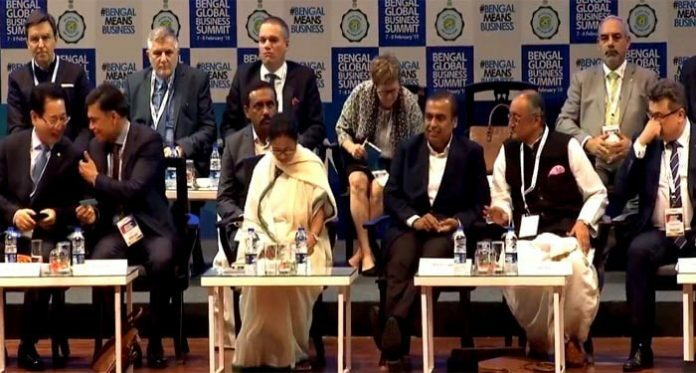 Mamata Banerjee with industrialist Sajjan Jindal to her right and Mukesh Ambani to her left at the Bengal Global Business Summit on Thursday. Kolkata: Bengal Chief Minister Mamata Banerjee, who of late is actively trying to stitch a collation of anti-BJP political parties, has promised a new industrial policy in the country once a new government assumes office at the Centre. 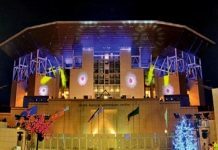 She was speaking at the two-day Bengal Global Business Summit (BGBS) that kicked off today at Biswa Bangla International Convention Centre at New Town. “We have the Lok Sabha elections shortly. 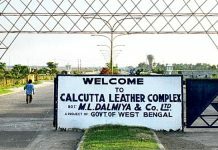 Let me assure my friends from the industry that after the change of government (at the Centre) we will formulate a new industrial policy for the country,” the Bengal CM and Trinamool chief said. Top Indian industrialists such as Muhesh Ambani, Bharti Mittal, Sajjan Jindal, Sanjiv Goenka, Punendu Chatterjee, Y K Modi, Niranjan Hirnandani were present on the dais. But as reported earlier, not a single Union ministers or representatives have turned for the Summit despite invitation. 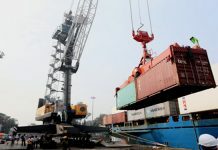 Maintaining that a number of industrialists have moved out of India in the last few years due to wrong policies of the Centre, she urged them to come back and invest here. “The thumb rule is work for everyone, accommodate everyone. Every state must grow. We want to work for the happiness of the people,” Banerjee said. In her speech, the Bengal CM claimed that due to her government’s hard work, Bengal has climbed to the top in various sectors. Banerjee emphasised that Bengal is the only place in India that is upholding unity in diversity in letter and spirit. She requested Kenji Hiramatsu, the Ambassador of Japan in India, who is attending the Summit, to grant soft loans for infrastructure projects in Bengal.